NICE believes that the Cancer Drugs Fund should be aligned with its cost-effectiveness processes, after the government recently announced a major change in how the Fund will be run. The Cancer Drugs Fund (CDF) has since March 2011 injected an extra £200 million a year into the NHS to pay for new oncology products not recommended by NICE, or under appraisal by the watchdog. But in August the government announced it was having to add another £80 million to this pot each year until the Fund ends in April 2016. This is because the current investment wasn’t enough to sustain the rising level of cancer drug costs, and the number of people with the disease accessing these treatments. As a result, NHS England said it would for the first time also need to assess the price  of the medicines passing through the Fund. It has not said how this will be done, but NICE believes it is the natural choice for this role. Speaking to a group of Health Select Committee  cross-Party MPs yesterday afternoon, Sir Andrew Dillon, chief executive of NICE, said: “There is currently a misalignment between how much we at NICE say the NHS should pay for new cancer drugs, and how much the CDF says. But whether NICE and its QALY formula for assessing the cost-effectiveness of drugs will be merged with the CDF has not yet been put on the table by the government. It would also seem a duplication of effort to have drugs rejected by NICE, to then go through the CDF just have NICE’s system applied again with the same outcome – i.e., a rejection. But the sheer size of this Fund and the drain on public resources, may necessitate such an alignment. This would be better than ditching the Fund altogether, and allow the government to save face on such a political issue. 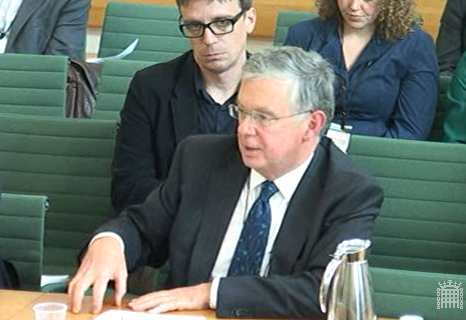 The MPs were grilling Sir Andrew and NICE’s chairman Professor David Haslam  on the results of a new consultation on its processes. This consultation is a typical review of NICE that the government undertakes every three years – however, this year Whitehall and NICE are deciding how new ‘value-based assessments ’ can be added into NICE’s processes in a shake-up to how it has worked in the past. Prof Haslam said NICE has seen a lot of comments on the consultation that ended in June, and the results of the review will be finalised at a public board meeting on 17 September. Details of exactly what the new processes might entail have not yet been released, but NICE is looking at adding two new ‘weightings’ to its current assessments. The two new value elements are: ‘wider societal impact’ and the ‘burden of illness’, both of which will be welded to NICE’s cost-effectiveness formula QALY (quality-adjusted life years) in an attempt to allow more medicines through the system. But Prof Haslam admitted that both of these are both “difficult to quantify and to implement fairly”. He added that taken to its logical conclusion, the use of a ‘wider societal benefit’ weighting would discriminate against people who are older, as a 60-year-old for instance cannot work for as long as a 20-year-old. He said however, that they have built a ‘failsafe’ into the process to ensure that age is never the final factor in deciding whether a medicine should be recommended. These new changes were meant to take effect from January this year but have been delayed due to the complicated nature of these new weightings, and how they can be merged into a fair and coherent NICE process. The board will assess the proposals from NICE and the respondents to the consultation in a fortnight. Sir Andrew says that if there is a unanimous agreement on these new policies then they could be implemented ‘immediately’ – although he admits that this will be unlikely. Regardless of the outcome the UK pharma industry will not be happy, as it has already told Pharmafile that these changes are not enough and would rather than see a wholesale political reform  of NICE and its QALY process, in order for it to say yes to more medicines. Finally, the MPs asked NICE about the very public spat it had with Roche over the recent rejection in its draft guidance over the Swiss firm’s new breast cancer drug Kadcyla  (trastuzumab emtansine). Sir Andrew, who has been bullish on the rejection, said that the £90,000 price tag and Roche’s refusal to drop the price to make it more affordable – were the main reasons for the ‘no’ last month. He reminded the MPs that by spending high amounts of money on one area or drug, that this displaces the amount that can be spent in other areas around the NHS. “This is what we have to consider for every appraisal,” he argued. He added that there is ‘no doubt’ that cancer drugs are getting ‘very expensive’, and more expensive than most other therapies. “But this is not a general trend [i.e., higher prices] outside of cancer”, he concluded.